Watch the SpaceShipTwo rocket plane drop from its WhiteKnightTwo mothership and fire up its engine for the first time during a test flight. Virgin Galactic's SpaceShipTwo rocket plane lit up its engine for the first time in flight on Monday, taking a giant supersonic leap toward outer space. The crucial 16-second blast took place at about 7:50 a.m. PT (10:50 a.m. ET), high above California's Mojave Air and Space Port. Virgin Group's billionaire founder, Richard Branson, was on hand to watch the proceedings. "Today was the most significant day in the program," Branson told NBC News afterward. "I think that for those people who have been good enough to stick with us for the last eight years, who signed up early on, their time to become astronauts is very soon now. ... We'll soon be able to make their dreams come true." Branson wasn't the only one watching: Rocket aficionados flocked to viewing areas near the airport to see the blastoff. Until Monday, Mojave-based Scaled Composites, which is building and testing the plane for Virgin Galactic's eventual use, had tested SpaceShipTwo only by dropping it from its WhiteKnightTwo carrier airplane and having its pilots guide the plane back through unpowered glides back to the runway. The engine, powered by a rubber-based solid fuel and nitrous oxide, had been fired only on the ground. Monday's test was radically different: WhiteKnightTwo released SpaceShipTwo from its traditional drop zone, at an altitude of around 47,000 feet. But after the rocket plane glides clear from the mothership, its pilot lit up the engine and pointed SpaceShipTwo upward into the sky, reaching a maximum height of 56,200 feet. The plane coasted back to a landing back at the Mojave airport, about 13 minutes after blastoff. Test pilots Mark Stucky and Mike Alsbury were at SpaceShipTwo's controls for Monday's flight, Virgin Galactic said. Afterward, the company said in a tweet that the pilots confirmed "SpaceShipTwo exceeded the speed of sound on today's flight!" The reported maximum velocity was Mach 1.2. SpaceShipTwo fires up its rocket engine for the first time in flight on Monday. A 16-second rocket blast sends SpaceShipTwo toward the heavens. A boom camera on Virgin Galactic's SpaceShipTwo plane shows the rocket engine firing. George Whitesides, Virgin Galactic's president and CEO, said in a news release that the flight test "went as planned, with the expected burn duration, good engine performance and solid vehicle handling qualities throughout." Eventually, SpaceShipTwo could break the space barrier as well as the sound barrier — just as its predecessor, SpaceShipOne, did in 2004. When the single-piloted SpaceShipOne made repeated flights beyond an altitude of 100 kilometers (62 miles), which is the internationally accepted boundary of outer space, it won the $10 million Ansari X Prize for private spaceflight. Ever since then, Virgin Galactic has been funding the multimillion-dollar development effort to create a fleet of passenger space planes. In the grand scheme of things, suborbital spaceflight isn't exactly new: The U.S. Air Force's X-15 rocket plane blazed that trail to manned spaceflight a half-century ago. The new twist is that it's being done by private companies rather than government programs. Scaled and Virgin Galactic have mapped out a series of flight tests that would gradually push the envelope, potentially leading to suborbital spaceflights over California's Mojave Desert by the end of this year. Virgin Galactic's goal is to begin passenger service, for tourists as well as researchers, at New Mexico's Spaceport America as early as next year. More than 500 people — including celebrities such as Ashton Kutcher — have already put down money for a $200,000 ride. The six-passenger, two-pilot plane is designed to give riders a commanding view of the curving Earth beneath the black sky of space, a few minutes of free-floating weightlessness, and a roller coaster ride back down to Virgin Galactic's spaceport. Other companies — including XCOR Aerospace and Blue Origin — are planning to get into the suborbital space passenger business as well, but if SpaceShipTwo's flight tests go well, Virgin Galactic is likely to become the market leader. 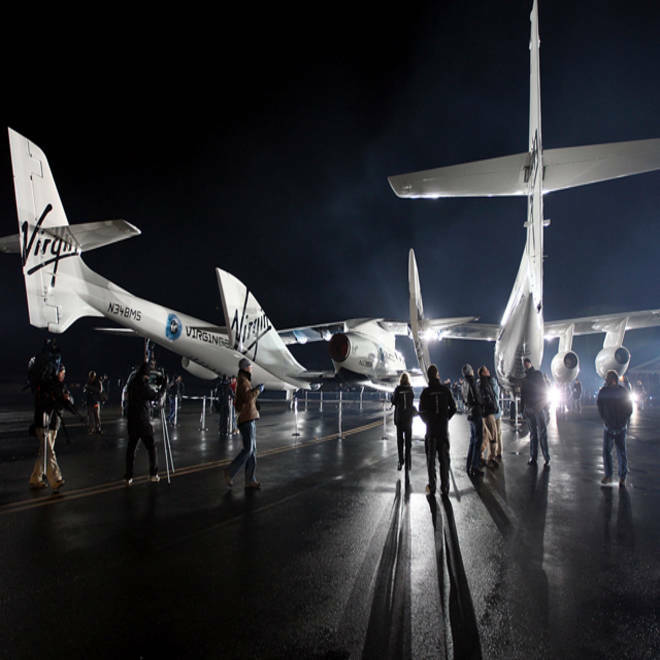 Branson has said he and his family would be among the first to fill SpaceShipTwo's passenger seats. "Like our hundreds of customers from around the world, my children and I cannot wait to get on board this fantastic vehicle for our own trip to space and am delighted that today's milestone brings that day much closer," he wrote in a blog post.